« Finishing a border and starting a binding! OMG, now I am really glad that I don’t have pets that can get up on my work. I love reading all the wonderful information/tips. This is an excellent tutorial. I love this quilt. Just found you by way of Facebook’s page – Hand Applique. Enjoy making scalloped borders too. Thank you for posting this great tutorial and the lovely quilts are a treat for the eye. Nice of you to share all the applique information. Valuable lessons. What a gorgeous piece Circle of Tulips is! So cheerfully pretty. I love the border! Love the quilt border design on Circle of Tulips. May I suggest using a walking foot the next time you add binding to a scalloped quilt. They work great. Thanks for sharing photos of the other quilts. Thanks for the tutorial. Your finished border is wonderful and your dog is gorgeous! Great tutorial on the binding. 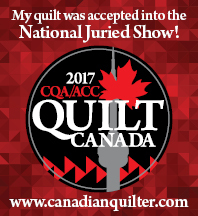 I saw Brenda’s quilt at QC and it is stunning! I can’t tell you how much I love everything about the circle of tulips quilt. The quilting, the borders, the backing…. greeat tutorial on the scallop border thanks!! I did see Brenda’s quilt and loved the idea of the Big buttons in the Center it really made her quilt perfect for how she put it together. Hahaha — magic scissors! 🙂 I love that your dog decided to nap on top of your gorgeous applique border. If it was one of my dogs, there would probably be muddy paws, or my Lulu would be slobbering all over one of her stinky bones on top of the border. Thanks for explaining about the shrinkage. I’ve only appliqued on blocks before and it wouldn’t have dawned on me to add THAT much extra for shrinkage on a border! I was really surprised when I measured my block and it had shrunk that much!